Take pictures of the instrument - ideally from all sides, with a rule next to it. For unfamiliar instruments, a close-up shot of the keys may show which are struck from above or underneath. Muchatera Mujuru's mbira from the Tracey Instrument Collection (TIC #125). Andrew Tracey's notes about Muchatera Mujuru's mbira, including a tuning plan. Metadata about the instruments is not yet shown on the website, but already stored in the database. Later versions of the site will feature a browsable instrument gallery. Try to find a quiet spot without ambient noise, ideally a 'dry' room with little reflexion, and high absorption and diffusion. At home, I sometimes build a little 'cave' out of chairs, blankets and cushions, just big enough to comfortably fit instrument and recorder. In the field, recording inside a car might be an option. 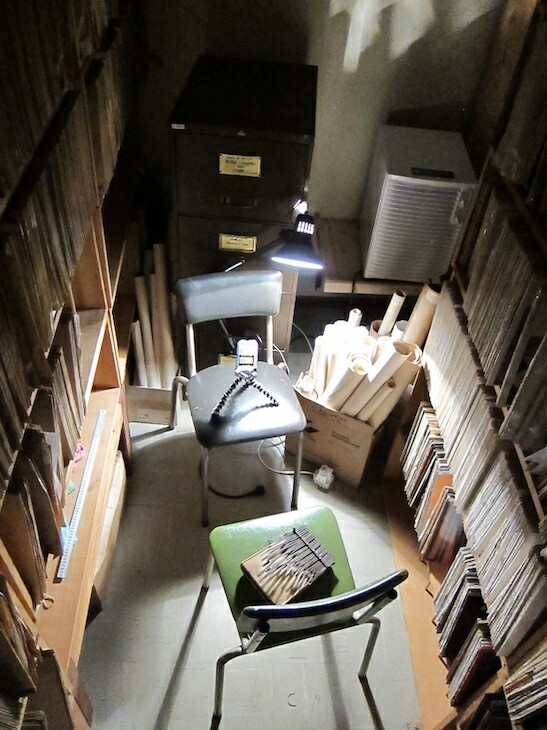 ILAM's 'Cold Room' with shelves full of records and literature turned out to be a decent location for sampling the library's instrument collection. Mute the buzzers. Even though it is an important component of the sound, in the synthesized playback the buzzing sometimes adds up in unnatural ways. Cloth and rubber bands usually work well. On Matepes with buzzers inside the bell resonator, I push in a a piece of cloth with a ruler, wrap around the buzzer rod, and pull it out again. Occasionally, if I find the buzzing or its construction remarkable, I sample the instrument twice, with and without buzz. Speak out loud all information needed to unmistakably identify the instrument, for anyone listening to the recording later. Quickly record all keys from left to right, as they are mounted on the soundbard, speaking out their number aloud. This 'index', together with the picture, may later unmistakably identify keys. Record 3-4 good takes for each key. Let them fade out until the instrument is completely quiet (sometimes there are very long resonances within the soundboard). Pay attention to ambient noises. Repeat as often as needed, better too many takes than too few. The reason for recording multiple takes of each key is to enable the playback engine to randomly pick one take each time a virtual key is struck. This makes the playback much more lively. Keep an eye on the recording level. The volume should be even, but sufficiently high while avoiding clipping. Speak comments as needed, e.g. when starting with a new rank of keys, repeating takes, starting over, etc. It will later save a lot of time when editing the recordings. If keys are clinking, try to pluck them a bit softer until the sound is clear. Later in the audio software the volume can be raised again. Loose keys - if you cannot fix them, nor play them softer - sometimes can be made ring again by pushing them against the metal bar (or slightly above the point where they cross the bar), with the finger or a pointed object. But beware not to accidentally affect the pitch of the key. None of the above is important enough to not capture an instrument's tuning if there's a unique occasion. Even a mobile phone recording in a noise environment can still be sufficient to synthesize decent playback and analyze the instrument's tuning.